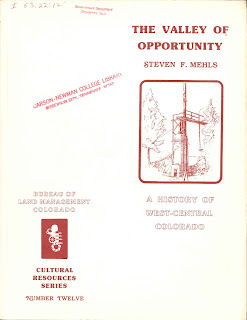 Mehls, Steven F. The Valley of Opportunity: A History of West-Central Colorado. Denver: Bureau of Land Management, Colorado State Office, 1982. 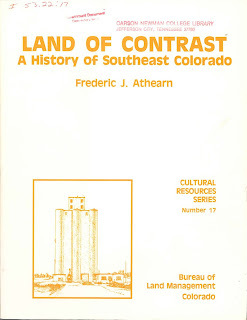 This volume can be found in many libraries of the Federal Depository Library Program, online at the BLM website, or in the HathiTrust Digital Library. Glasse, Hannah. The Art of Cookery Made Plain and Easy: The Revolutionary 1805 Classic. Mineola, NY: Dover Publications, 2015. It's difficult to review and rate a cookbook written for another time and place. As I read through the recipes, or perhaps I should call them receipts, I could not help but be thankful that much of the preparations that went into a meal at the turn of the 19th century are no longer required. We are able to go to the grocery store and pick up meat that has already been skinned, cut, and often deboned for us. Thanks to our transportation systems, foods that once were seasonal are often available year-round. This book must have been, as its title suggests, revolutionary for its time. It includes recipes that were inspired by the British West Indies and America. One can find recipes for haggis, moonshine, and lip balms, as well as the meats, vegetables, and sweets likely to be placed on the table. I could not help but think that Hannah Glasse must have been the Julia Child, or at least the Martha Stewart, of her time. This review is based on an e-galley provided by the publisher through NetGalley for review purposes. Curto, Rosa M. Art from Simple Shapes: Make Amazing Art from 8 Simple Geometric Shapes! Mineola, NY: Dover Publications, 2015. Using just a few basic geometric patterns, children learn to draw many things. Most of the patterns require a few additional strokes to complete the design. Some designs are more difficult than others. It's a great book for teaching children the art of drawing. I received an advance e-galley of the book from the publisher through NetGalley for review purposes. This morning I noticed a post in my Facebook feed. A person had written to a group focused on research in a single county about her new book. In the post she claimed to have "finished writing" the history of a well-known family in the county. While I have never personally researched that family, I know many people who have and know enough persons related to the family that I expected her book to be hundreds of pages. I clicked over to Amazon where the book was being sold, only to discover that her book was only 30 pages in length. My immediate thought was, "You have barely scratched the surface." The book was being sold at an inflated price for the amount of research put into it. I suspect anyone who pays attention to the number of pages in the book will give it a pass. After all, the title implies the author has researched the line all the way back to England, which would not have been in the recent past, knowing the family's deep roots in the region. I suspect that in a few days we'll see bad reviews of the book from the few people who actually are tricked into purchasing it. I would love to see the book just to see how she managed to write a complete history in 30 pages. Did she omit references? Did she not write complete sketches? Did she neglect land and property records? Did she consult wills and probate records? Is the book merely lists of names and dates? Unless I run across it in a public library, I'm unlikely to ever know. However, I am certain that I could write 30 pages on this particular family in almost no time with very minimal research, and most of it would be 20th or 21st century. This would not even begin to scratch the surface of the family and its legacy. It would not even begin to get to the generations that require a little more digging to produce proof that meets genealogical proof standard. I will not be funding the exaggerated claim of the author of the book that popped up in my Facebook feed. I evaluated it before I even saw it based on its length's ability to cover its claims. It did not measure up. 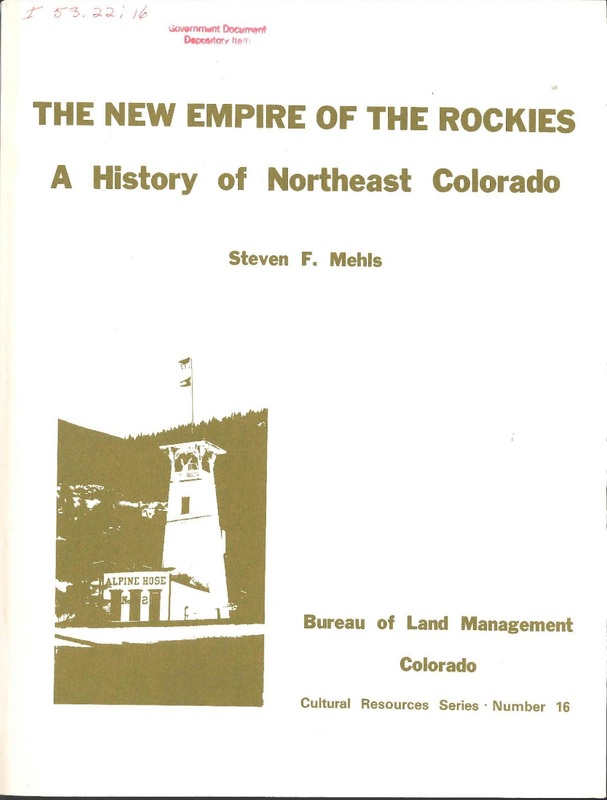 Mehls, Steven F. The New Empire of the Rockies: A History of Northeast Colorado. Denver: Bureau of Land Management, 1984. This volume is available at many libraries associated with the Federal Depository Library Program or online through HathiTrust Digital Library. We memorized these words as children. It is the fourth of the Ten Commandments. While the Jews observed their Sabbath on Saturday, the seventh day, Christians celebrated a sabbath principle on Sunday which is often referred to as the Lord's Day. In recent years many no longer observe this commandment in any shape or form. Choirs for ages three through high school presented a program called "Songs of the Season" at our church yesterday. One of the parents came in Sunday morning. His daughter's soccer practice had been moved from two to four until five to seven. The choirs were meeting in the five o'clock hour for their normal rehearsal. The performance was at six. He was trying to figure out just how long his daughter could stay at soccer. It was clear the parent considered soccer more important than the rehearsal time. When I was growing up, the parent would have told the daughter that she was going to church and not to soccer. Of course, the soccer coaches in the 1970s, if soccer was even played in our area then, would not have scheduled a practice during what was certain to be a conflict with church services. It made me reflect on what we are communicating to today's children. Are we showing them the importance and priority of God in their lives when we won't prioritize Him over secular activities? I work at a Christian university which has also quit observing the Sabbath principle. Facilities such as the library which once were shuttered on Sunday are now open, even during times where church services are being held. This same institution wants its employees to be involved in church activities and leadership, yet they make it difficult for employees who must work to keep these facilities open to do so. Are we teaching students the importance and priority of worship? Are we teaching them the principle of a Sabbath rest? It is time for Christians to rethink their priorities in the light of Biblical teaching. We need a few more parents standing up to tell their kids coaches that their sons and daughters will be at church. We need a few more Christian employers to follow the lead of Chick-Fil-A and Hobby Lobby by being closed on Sunday. We need to spend more time with family and in worship of a truly awesome God. Like clockwork, students heard these words on the day of the spelling test. Did you think I was kidding on Monday when I said a test would be given Friday? Let's see how well you remember your spelling and vocabulary terms this week. You will use each word one time to complete one of the sentences. 1. You will find my 7th great grandmother listed on my ____________________ chart. 2. Typically four or five generations will be included on a ______________ chart. 3. The slave was granted a _________________ by his owner. 4. I am a ___________________________ of my grandfather. 5. The man told Bob and Ben his wishes for the distribution of his estate but did not write it down; therefore, it is a _____________________ will. 6. Jill gave an _______________________ used in the court case. 7. The census taker recorded all the families in his ________________________ district. 8. Pappaw is buried in the ____________________. 9. A ______________________ DNA test pertains to the mother's mother's mother's line. 10. A Y-DNA test provides results for the ____________________________________ line. 11. Only males have a Y _____________________. 12. He is not in my direct line but he is a ________________________ relative. 13. A dictionary of place names is called a _____________________________. 14. ____________________________ is the practice of marrying within a small population group such as the Amish. 15. The study of family history is also known as ________________________. 16. A person's _____________________ reveals his family history and is sometimes placed on a web site of a major corporation bearing the same name. 17. A person who left no will is said to die ____________________. 18. A privilege or right called an ____________________________________ is often passed along in a deed. 19. An ______________________ DNA test reveals cousins from all branches of one's family as long as they have tested with the same company or provided results to a site such as GEDmatch. 20. Your ___________________ line comes from your mother. This morning as I was reading Facebook I moaned as I saw the (misspelled) word "cementaries" materialize in a post. I immediately thought of the usual misspelling of the word which omits the "n" in the above misspelling and of the various misspellings for the word "genealogy" itself. I reflected on school days when each Monday we were given a list of about 20 words that we were expected to spell correctly by Friday. As we got older, we were also expected to use them in a sentence or define them as well. I then realized that many new genealogists (and perhaps a few who have a little more practice) might benefit from such a spelling and vocabulary test focused on genealogical terms. I'm sure you know the routine. You memorize the spelling, look up the words in a dictionary, and then write a sentence using them. Don't forget! A test is coming on Friday. I hope you will all make A's on the test on Friday! Lorac, E. C. R. Murder by Matchlight. Mineola, New York: Dover, 2015. This reprint from the Golden Age of Mysteries features the death of a man known as John Ward on a bridge. Although witnesses catch a glimpse of the murder, his identity is unknown. A small pool of suspects, most of whom reside in the house with the man known as Ward, are interviewed by Inspector MacDonald and his colleagues. Evidence points to "John Ward" being an assumed name and another identity is found for the man which begins to yield motives in the group. While some of the characters could have been a bit more developed, others are sufficiently developed. Although it is not a particularly complicated mystery, it is enjoyable. Dover Publications is doing a great service providing better access to this and other mysteries of the Golden Age. This review is based on an Advance Readers Copy provided by the author through NetGalley with the expectation a review would be written. Athearn, Frederic J. 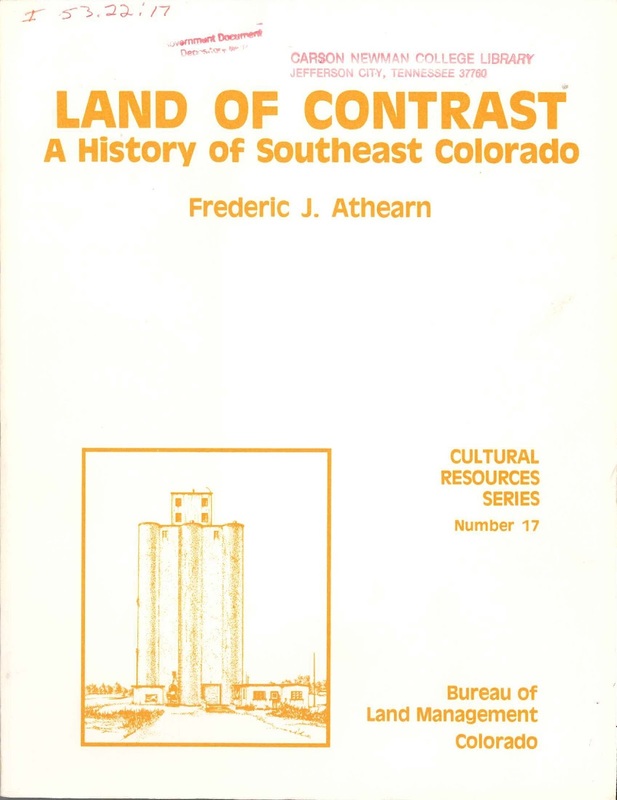 Land of Contrast: A History of Southeast Colorado. 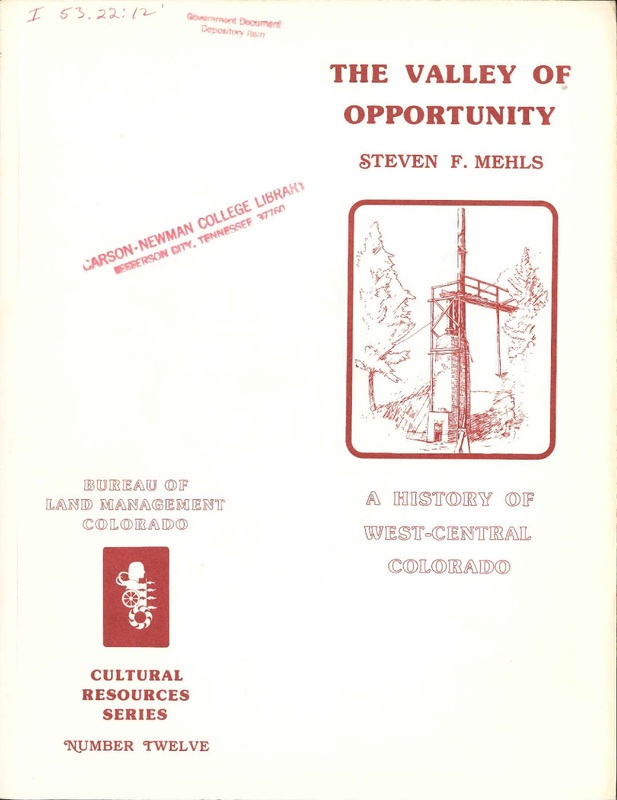 Denver: Bureau of Land Management, 1985. It's available at many Federal Depository Library Program libraries and at HathiTrust Digital Library.